The RCIPS will be holding a District Community Meeting in East End on Thursday evening, 30 August. The meeting will be held at 7:00PM at the East End Presbyterian Church Hall. The meeting is open to the public and residents are encouraged to attend in order to express concerns and ask questions. Refreshments will be served. It’s (probably) not the end of the world, but this tornado made of fire certainly makes it look that way. While fighting a massive blaze on Tuesday, Leicestershire Fire and Rescue in England caught video of what it dubbed a “firenado.” Per the video’s caption, a firenado is created as cool air and hot air meet, forming an apocalyptic whirlwind as the swirling air brings flames into the sky. According to the Guardian, the plume clocked in at more than 50 feet high. The fire originated in a plastics factory in Derbyshire. There have been no reported injuries, but people could reportedly see the thick black smoke from Nottingham’s city center, which is more than 26 miles away. Honestly, a firenado could only get cooler if someone added sharks into the mix. As part of its continued effort to improve the Cayman Islands road network, the National Roads Authority (NRA) continues to work diligently on the Crewe Road project. The NRA will be closing the westbound lane of Crewe Road at the Silver Oaks Roundabout on Saturday, 18 August and Sunday, 19 August 2018 to help facilitate road works. All motorists should plan accordingly and use the Linford Pierson Highway (LPH) during these times. The Ministry of Education and Department of Education Services (DES) wishes to inform all who attend Government schools of the upcoming orientation dates for the 2018-2019 school year. Royal Caribbean have announced their latest video, “Navigating a Narrow Port: How One of the World’s Largest Cruise Ships Sails into St. Thomas.” With narrow water ways, sailboats anchored in the harbor, a tight turn and just six feet of clearance below the keel, the water around this popular port is one of the most difficult to maneuver. But thanks to an expert marine team using the industry’s leading technology, arriving is just another day at the office for the Oasis of the Seas crew. The Cayman Islands Institute of Professional Accountants (CIIPA) invites the community to walk or run for Special Olympics Cayman Islands (SOCI). CIIPA’s annual charity run has raised more than $30,000 for local charities in recent years including the Cayman Islands Red Cross and the Cayman Islands Crisis Centre. 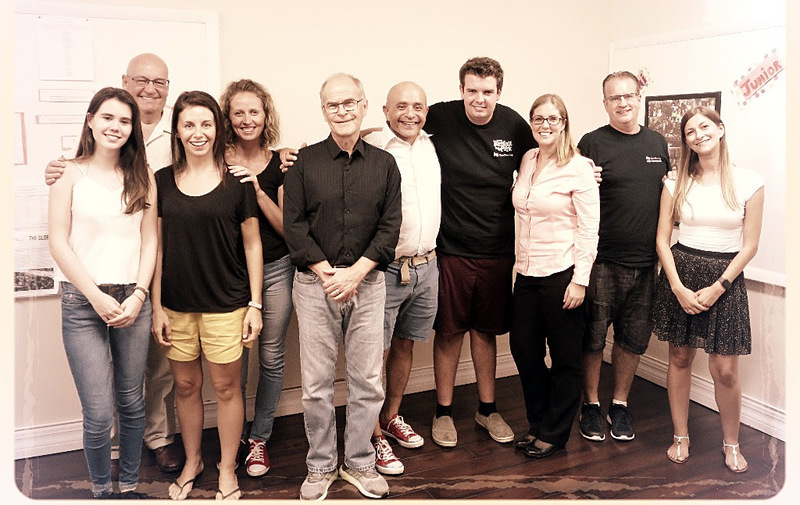 This year, CIIPA’s Social Committee selected SOCI’s World Games team as the beneficiary. It’s a milestone year for Special Olympics Cayman Islands — not only are they celebrating 30 years in Cayman and the 50th anniversary of the Special Olympics movement, but they are also preparing the World Games taking place in Abu Dhabi in 2019. Walkers and runners of all levels are invited to come out Saturday, 18 August and support SOCI’s World Games team. Participants can choose between a 5K or 10K distance, both starting at 6:30 a.m.. This is chip-timed event and two water stations will be available on the course. The $25 race fee includes breakfast, and entry into the post-race prize draw. To register, visit www.ciipa.ky/Events-Calendar. The NCVO’s New To You Bargain Shop is extending its opening hours from three to seven hours daily for the remainder of August. Starting on Monday 13th August the Bargain Shop will open from 10:00am to 6:00pm daily (except Sundays) continuing through the end of the month. Customers can find a myriad of lightly used products on sale including household items, baby supplies, stuffed animals and toys, shoes, books, clothes (including select school uniforms) and craft items. The New To You Bargain Shop is located at 90A Anthony Drive off Smith Road (beside the rear entrance of the Pines Retirement Home). Sales from the thrift shop benefit the NCVO’s children’s programmes. The Cayman Islands Seafarers Association wishes to inform all Members that there will be a General Meeting, on Tuesday 21 August at 7:30 PM. in the Seafarer’s Hall, 11 Victory Ave. Prospect. Buses will be provided from West Bay Town Hall at 6:00 pm”. The Family Resource (FRC) is hosting a Domestic Violence Intervention Training (DVITP) workshop for frontline professionals and interested members of the community on Wednesday, 29 to Friday, 31 August. The free three-day workshop will be held in George Town Library, 9 a.m. to 5 p.m. As well as taking part in interactive presentations from external facilitators, participants will learn about ways to support individuals and families dealing with domestic violence. For further information and to register for the Grand Cayman workshop contact the FRC at 949-0006 or email frc@gov.ky to register. Please note that the DVITP scheduled for Cayman Brac this month has been cancelled. How is the political climate shaping the patent market? With IAM’s Patent Law & Policy returning to Washington D.C. on November 13, 2018, those invested in how the political landscape will shape the patent market are already making their preparations to attend. Will you be joining them? From the latest Supreme Court decisions to the potential effect of the 116th U.S. Congress, this event will provide exclusive access to timely and relevant insights from industry influencers and key decision makers. What can Patent Law & Policy offer you? Join us in Washington D.C. to enjoy formal and informal networking opportunities with your colleagues and peers—senior decision makers, licensing and deal influencers, policy experts, and other members of the global IP community. We would love to see you there! Secure your place today here using code PLAPSEB to save $200. Discounted places are limited, so book early to guarantee your place at the reduced rate. We at IAM look forward to seeing you in Washington D.C. in November! 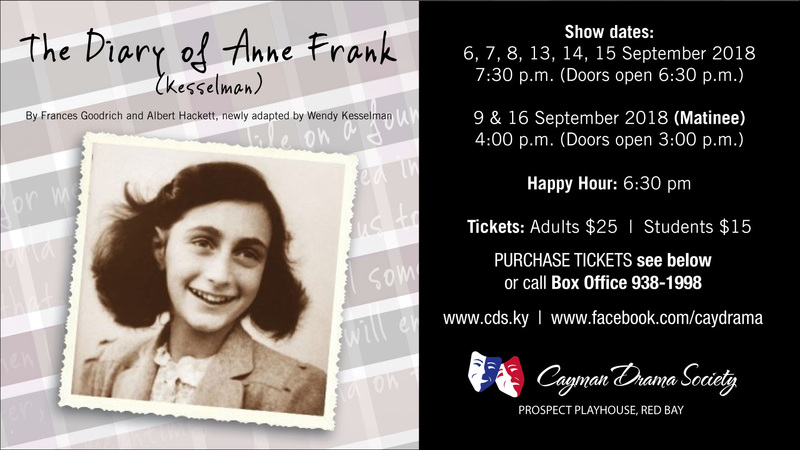 General tickets now on sale for Cayman Drama Society’s DIARY OF ANNE FRANK! DON’T MISS YOUR CHANCE TO SEE A PIECE OF HISTORY COME TO LIFE! Cayman Drama Society is thrilled to announce that tickets to our next main production, The Diary Of Anne Frank, are now on sale for all. Simply click this link and get yours now! Set in World War II, The Diary Of Anne Frank has been brought back to life by Wendy Kesselman in this powerful and emotional new adaptation of the original diary. Come be a fly on the wall in The Secret Annex, where a group of desperate Jewish people are living in hiding from the Nazi regime. Watch the highs and lows of their underground life together during World War Two, through the eyes of the most positive household member. This new version brings history to our stage through a youthful voice of hope, and a young girls dream of becoming a writer. Shows are at the Prospect Playhouse on Thursdays, Fridays andSaturday evenings from 6th Sept to 16th September at 7.30pm, with Sundaymatinees on the 9th and 16th at 4pm. Doors open one hour before the performance with The Curtain Call Bar. Tickets for all performances are only CI$25 for Adults and CI$15 for Students (this show has a PG rating and is approximately 2 hours long plus a short interval). The Department of Environmental Health (DEH) reminds all business operators/owners/strata in Grand Cayman, Cayman Brac and Little Cayman, who pay their fees by bi-annual instalments that garbage fees are now due for the period ending 30 June 2018. Garbage fees are payable by cash, cheque, debit or credit card. Debit and credit card payment options are only available on Grand Cayman at this time. In Grand Cayman, payments can be made at any of the local post offices or at the DEH’s main office, located at 580 North Sound Road from 8.30 am to 5 pm, Monday to Friday. In the Sister Islands, payments can be made at District Administration. For additional information, please contact the DEH by telephone at 949-6696 or by email at dehcustomerservice@gov.ky. The free presentations, being hosted with the support of the Alex Panton Foundation, will educate parents, residents and the community on how to identify self-harm and suicidal thoughts/behaviours. Attendees will also be advised about how to respond and who to reach out for help, guidance and support. The Public Health Department reminds parents that school entry screening continues. Health screenings will continue to take place at the John Gray High School medical Centre from now until 17 August, and at the Public Health Department at the Cayman Islands Hospital from 20 – 31 August 2018. Completed forms from private physicians should be submitted to the Public Health Department, Monday to Friday between 8.30 a.m. and 4.30 p.m.
For further information call: 326-4890, 326-3882 or 925-5401. The Department of Vehicle and Drivers Licensing (DVDL) would like to inform the public that Andy’s Auto will not be conducting vehicle inspections from 11 July – 17 August, as the certified inspector will be off island. University College of the Cayman Islands: Make success happen! Jump start your career!Have you been putting off those learning and professional goals? UCCI is here to help you start accomplishing them. We have various undergraduate, professional and continuing education offerings. We can even customise training for organisations no matter the size.Prospective students looking to register for Fall 2018 must complete and submit their online application by Monday, July 30, 2018.High school students, including Dual Enrollment applicants, must not await their external exam results (e.g. CXC, IGCSE, etc,) to submit their online application. Exam results can be submitted as soon as they become available.All supporting documentation should be brought into the Office of the Registrar by Monday, August 20, 2018.For further information, email Ms. Stephanie Scott, Admissions Coordinator, or call 623-8224. The Little Cayman Vehicle Licensing Visit is Thursday (16 Aug) from 9am to 230pm at the District Office. CIIPA Charity 5 & 10K is Saturday (18 Aug) at 630am starting at Cricket Square. Learn more at caymanactive.com. YMCA Summer Camp is Monday – Friday (20 – 24 Aug). Email ysummercamp@ymcacayman.ky. The Cayman Islands Seafarer’s Association is hosting a general meeting on Tuesday (21 Aug) at 730pm in the Seafarer’s Hall in Prospect. Buses will be provided from West Bay Town Hall at 6pm. The Chamber of Commerce is hosting a course on SME Workshop: Navigating the Digital Age Landscape on Thursday (23 Aug) from 530 – 730pm at Governor’s Square. Register online at caymanchamber.ky. The Chamber of Commerce is hosting a course on Dealing With Difficult Customers on Thursday (23 Aug) from 9am to 1pm at Governor’s Square. Register online at caymanchamber.ky. The National Gallery presents a Lecture with Fashion Designer Jawara Alleyne on Saturday (25 Aug) from 6 to 7pm. Quincy & Friends in Concert presents a variety concert and fashion show on Saturday (25 Aug) at the Aston Rutty Center with doors opening at 7pm. The Open Road Race 34 Miles cycling event is Sunday (26 Aug) at 645am. Learn more at caymanactive.com. All Schools in the Sister Islands reopen for Term 1 of the 2018/19 year on August 27th. The Chamber of Commerce is hosting a course on Exceeding Customer Expectations on Tuesday (28 Aug) from 9am to 1pm at Governor’s Square. Register online at caymanchamber.ky. The Family Resource Centre is hosting a free three-day Domestic Violence Intervention Training program in the Brac Reef Resort Conference Room, Cayman Brac on Tuesday, 28 to Thursday, 30 August 2018, 8.30 a.m. to 5 p.m. The certificate course is for frontline professionals or those who want to learn more about the dynamics of abusive relationships and help others. To register, please call the FRC at 949-0006 or email frc@gov.ky. The Ministry of Community Affairs is inviting the public to attend one of its five presentations, later this month, identifying self-harm and suicidal thoughts. The free presentations, being hosted with the support of the Alex Panton Foundation, will educate parents, residents and the community on how to identify self-harm and suicidal thoughts/behaviours. Attendees will also be advised about how to respond and who to reach out for help, guidance and support. The next meeting is Wednesday (29 Aug) at 7pm at Bodden Town Civic Center. Cayman Brac Summary Court is Thursday (30 Aug). The Community Thatch Plaiting Class is Thursday (30 Aug) from 7 to 9pm at Heritage House. The Little Cayman Vehicle Licensing Visit is Thursday (30 Aug) from 9am to 230pm at the District Office. If you have a kid between the ages of 10-14 that likes to take photos and have fun, then we would like to invite them to participate in the Fun Under the Sun photography competition! We would like to encourage the kids to submit 1 photo per student if they would like to participate to FunUnderTheSun2018@gmail.com. The deadline is August 31st. The submission deadline for the Business Excellence Awards is Friday (31 Aug). Visit www.businessexcecllenceawards.ky to submit your business. The Rotary Club of Cayman Brac Annual Fry Jack Bonanza is Saturday (1 Sept). The Lions Club of Tropical Gardens in association with the Cayman Islands Cancer Society presents Steve Higgins and Friends in Embracing Romance on Sunday (2 Sept) at 6pm at Marriott. Tickets are available at Funky Tangs and Super Stitch. For more information call 925.9134. Members of the Cayman Islands cabinet and elected members of the Legislative Assembly and staff will travel to Cayman Brac in early September, to conduct their meetings there. Cabinet will meet in the District Administration Building on Tuesday, 4 September, 2018, and the fifth meeting of the Legislative Assembly will be at the Aston Rutty Centre on the Bluff beginning at 10 a.m. Wednesday, 5 September. Radio Cayman and CIGTV will broadcast the audio of the LA meeting live. Celebrate Cayman Celebrations: 60 Years of our Coat of Arms heads to Cayman Brac on Thursday (6 Sept). Log on to celebratecayman.ky for more information.